Product prices and availability are accurate as of 2019-04-11 08:27:49 EDT and are subject to change. Any price and availability information displayed on http://www.amazon.com/ at the time of purchase will apply to the purchase of this product. 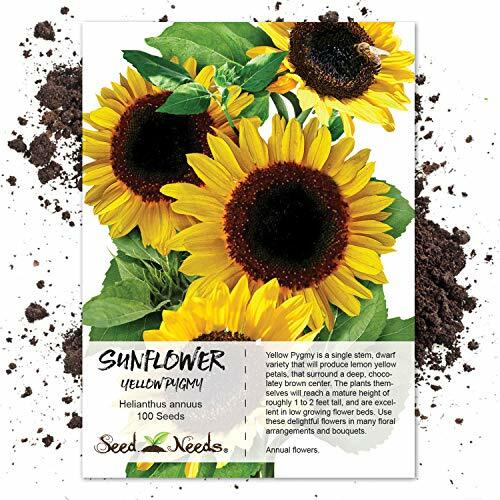 Grow a garden filled with the delightful, Yellow Pygmy Sunflower, from freshly harvested Helianthus annuus flower seeds. 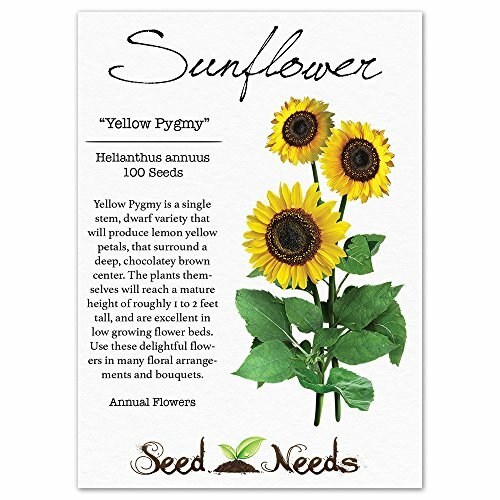 Yellow Pygmy will produce lemon yellow petals, which will surround a chocolatey brown center. The plants themselves only reach a mature height of roughly 1 to 2 feet tall and are perfect for low growing flower beds. Yellow Pygmy is a single stem variety, which means that it will grow upright, displaying one single bloom per plant. 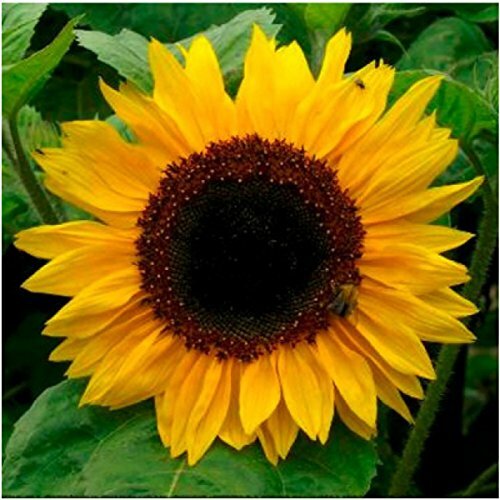 The leaves, like most sunflowers, are large and spade shaped, while the flowers measure about 6 inches in diameter. Yellow Pygmy Sunflowers will attract all sorts of beneficial insects to the garden, such as butterflies, bumblebees, honeybees, hummingbirds & ladybugs as well. The plants also make an excellent cut flower, for many floral arrangements and bouquets. Yellow Pygmy is categorized as an annual flowering plant. This means that it will grow quickly from freshly harvested sunflower seeds, producing it's leaves, flowers and seeds all within a single growing season. The plants later wilt with the cooler temperatures of the Autumn season. The seeds can be collected if the squirrels and birds don't get to them first. Quality Sunflower seeds packaged by Seed Needs. Intended for the current and the following growing season. Packets are 3.25" wide by 4.50" tall and come with a full colored illustration on the front side, as well as detailed sowing instructions on the reverse. Yellow Pygmy will produce lemon yellow petals, which will surround a chocolatey brown center. The plants themselves only reach a mature height of roughly 1 to 2 feet tall and are perfect for low growing flower beds. Yellow Pygmy is a single stem variety, which means that it will grow upright, displaying one single bloom per plant. The leaves, like most sunflowers, are large and spade shaped, while the flowers measure about 6 inches in diameter. Yellow Pygmy Sunflowers will attract all sorts of beneficial insects to the garden, such as butterflies, bumblebees, honeybees, hummingbirds & ladybugs as well. The plants also make an excellent cut flower, for many floral arrangements and bouquets. All Sunflower seeds sold by Seed Needs are Non-GMO based seed products and are intended for the current & the following growing season. All seeds are produced from open pollinated plants, stored in a temperature controlled facility and constantly moved out due to popularity.